“I noticed it as soon as I walked in,” said Trish, a local dowser and member of Slimbridge Dowsing Group (SDG). So she asked the proprietor, Michael Chaplin, for permission to dowse, and he was delighted. 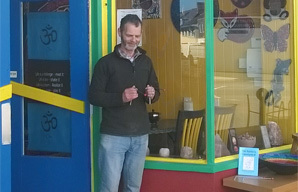 It is possible the energy spirals were there when the premises were occupied by the Community Shop before Michael moved in, but it is more likely that the uplifting energy has arrived as a result of all the colourful handicrafts and Fair Trade items he stocks from all over the world. This often happens. Seeing the rods apparently move by themselves got Michael interested in dowsing too, and he now stocks dowsing rods, SDG’s book, 'This Rabbit is Constipated' containing reports of SDG speakers’ talks that have appeared in the Gazette, and copies of their quarterly newsletter. He is currently offering the rods and book at a special price, and newsletters are free anyway.